Do you wish you could stop binge eating? Are you sick and tired of bingeing (or bingeing and purging)? ​Do you feel "out of control" around food? Struggling with binge eating is exhausting. I write and speak about eating disorders and body image issues on Fox News, The Huffington Post, Psychology Today, The Binge Eating Disorder Association National Conference, and Therapy Centers. "I just completed your training "Finding Freedom From Binge Eating." I found it very informative. I like that you give tools/ steps to start the process. For me, I find it incredibly difficult( almost impossible) to not binge when I begin eating foods that I consider * forbidden. * I am now aware of how damaging this thinking is and have been working on it. Tips that you gave for in the moment are incredibly helpful for me because this is where I struggle the most. Thank you for all you do!!" Your trainings as super helpful for me a clinician! I use them for myself and recommend them to my clients all the time. Thanks so much for all the work you do. -Danielle Ellen, Eating Disorder Therapist. I wanted to reach out and thank you for this training. I've felt so alone in all of this and just completely tired of having to battle this everyday for so long. I actually feel hopeful after finishing it." Your training on finding freedom from binge eating was seriously so helpful!! I can't thank you enough for the amazing work that you do." 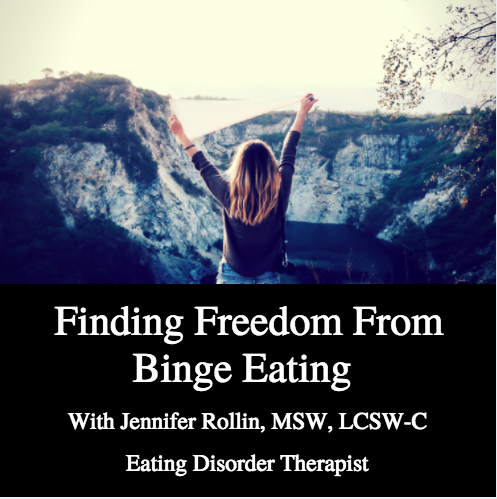 "Finding Freedom from Binge Eating" is an incredible training. It helped me to identify the cause of my bingeing and taught me ways to intervene when I have urges. I'd highly recommend it to anybody who struggles with bingeing or compulsive overeating." This on-demand training shares with you the strategies, concepts, and assignments, that I share with clients. You will learn what sets people up to binge eat, and action steps that you can take to enhance your recovery. This training will get you started on the path towards finding freedom from binge eating, to develop a more peaceful relationship with food. For $200 you will receive the 52 minute webinar, a 14 page workbook, 10 recovery inspiration cards, as well as a list of suggested resources.